​Old Man River. People Will Say We’re In Love. The Impossible Dream. All these and more will be yours when we bring “Give My Regards to Broadway” to the Unitarian Church’s Sanctuary on Sunday, Nov. 8, at 3 pm. Three incomparable Sarasota entertainers will deliver the goods. Lee Dougherty-Ross will be on piano; vocalists will be Amy Jo Connours and Jason Stearns will sing the greatest of Broadway hits. If you love the old Broadway favorites this concert is for you. Tickets are $15 online (go to this page to order) and at the door. Mezzo soprano Amy Jo Connours is a prominent soloist and is active in many of Sarasota’s music organizations. She is currently serving as the alto section leader for Sarasota’s premiere professional ensemble, Gloria Musicae, in addition to adding her voice to Key Chorale, Sarasota’s symphonic choir, as a frequent soloist. She also spent several years singing with the ensemble, Three Divas and the Dons, where she performed with four other musicians, arranged music and choreography. Connours is a frequent guest artist for the Artist Series Concerts of Sarasota, has been the guest soloist for Soloisti D’Oneco, and has toured through Europe in Spain, Ireland and Scotland. She holds a B.A. in Music from FSU, and also plays viola. An accomplished Oratorio singer, Amy has sung Handel’s Messiah, performed Mendelssohn’s Elijah, Mozart’s Coronation Mass, and has performed the beautiful and haunting Celtic Mass by Michael McGlynn, in addition to Durufle’s Requiem, to multiple ovations. She easily crosses over to perform heartfelt gospel and the blues. 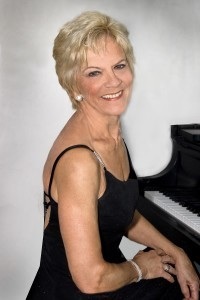 Ms. Connours began singing with Mozart’s The Magic Flute and has amassed an eclectic repertoire that features her silky mezzo tones which cross over multiple genres from opera, oratorios and the classics, to jazz and contemporary composers. Jason Stearns has steadily built a reputation as a distinguished interpreter of the most unique and challenging roles in the dramatic baritone repertoire. A graduate of the Eastman School of Music, he went on to be the leading singer in the famous Las Vegas review, “The Lido de Paris,” where he appeared in over 2,500 performances. For 21 years, Jason was a featured soloist and chorus member in The United States Army Band Chorus and Chorale in Washington, D.C., where he appeared before many U.S. presidents, heads of state, and visitors from around the world. Jason and his wife, Suzanne, sang all over the world on the Royal Viking Cruise ship line. He has dozens of leading operatic baritone roles to his credit, Broadway roles, concerts, and in many various productions all over the United States and abroad. In 2001, he was invited to join the Metropolitan Opera in New York where he first appeared in the regular chorus, and then later as a leading baritone soloist when he made a last-minute debut in the leading baritone role of Barnaba in the opera “La Gioconda.” He has sung and understudied many leading and supporting roles there since. Not only a singer, Jason Stearns has taught many professional singers, as well as aspiring students, and enjoys sharing his lifetime of knowledge on how to sing, and how to perform. Lee Dougherty Ross debuted at age 12 as a piano soloist with the Norfolk Symphony Orchestra and later performed the Rachmaninoff 2nd Piano Concerto with the Eastman Rochester Symphony. She graduated from Eastman School of Music with a double major in both piano and voice. Her singing career included performances at Carnegie Hall, Alice Tully Hall and the Broadway stage in New York, Queen Elizabeth Hall in London and the Kennedy White House. She and her husband Jerry Ross founded Artist Series Concerts of Sarasota, now in its 20th season. The Unitarian Universalist Church of Sarasota is the largest Unitarian church in Florida with nearly 500 members and friends. Founded in 1952 with 12 members, it is now a growing church with an active calendar of cultural and social events.